For this piece, as for the others on this series, I did the rough drawing on Photoshop, and the final art on paper. I’m kinda doing the opposite of what I used to do, and sometimes still do for other kinds of drawings, which was to start sketching on paper, and do the final image digitally. 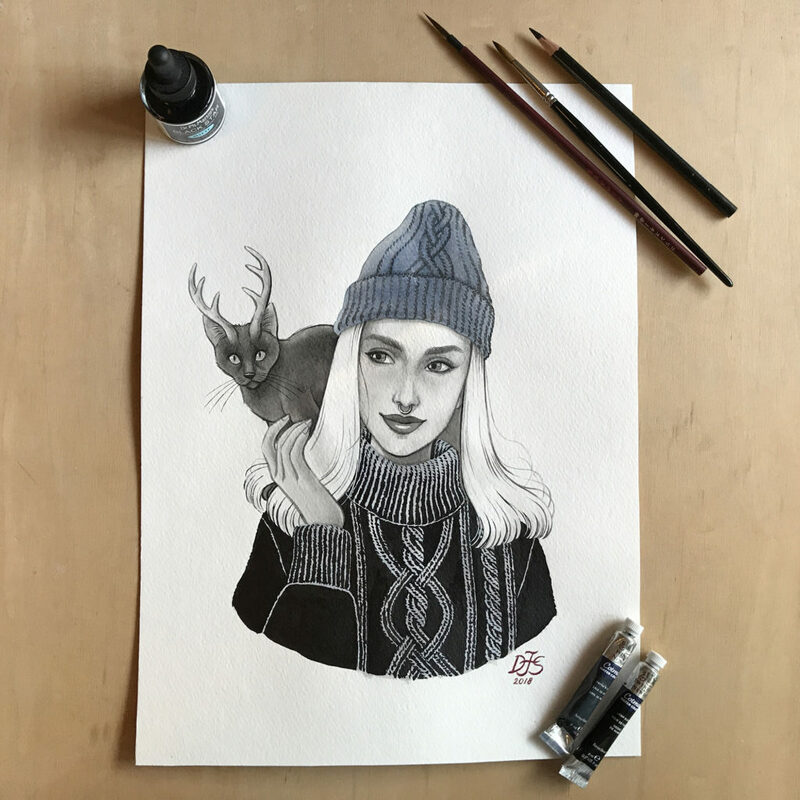 Scroll down to see the final digital sketch, which I printed and used to trace on watercolor paper, to finally ink and paint it. 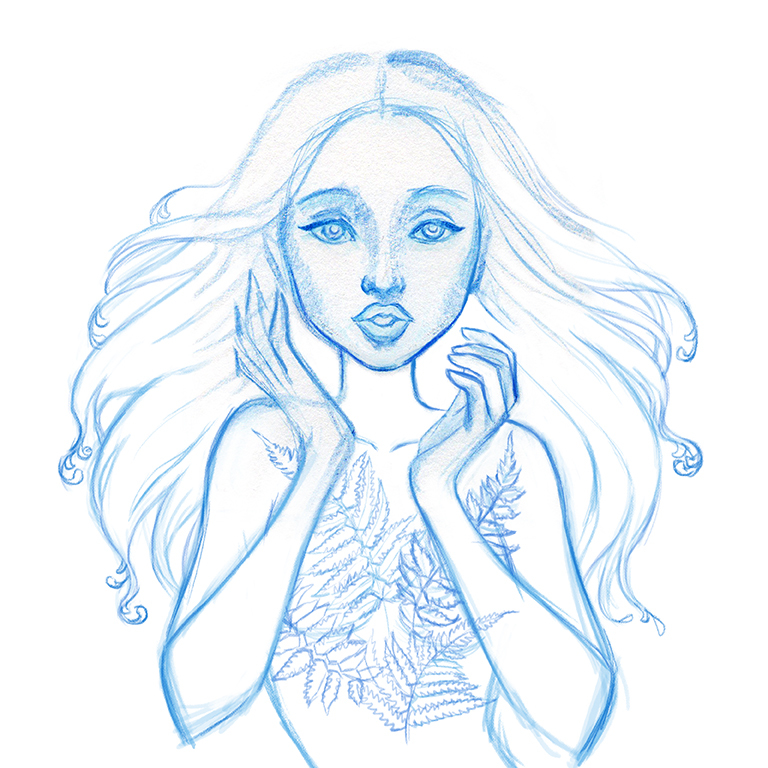 Following up up on my Greek Mythology series, after Cupid and Demeter, this is a Dryad, a nymph of the trees. A Dryad is not just one specific entity, it’s a kind of nymph, along with so many others. So maybe, I’ll still draw other Dryads in the future, to add to the collection, since Nature is one of my main inspirations anyway 🙂 But in the meantime, there are so many other characters in Greek Mythology that I’ll probably do something else before I get to this kind of nymph again! So many interesting gods and goddesses to pick from, and heroes and other mythical beings to illustrate, it feels like an endless source of material to depict! 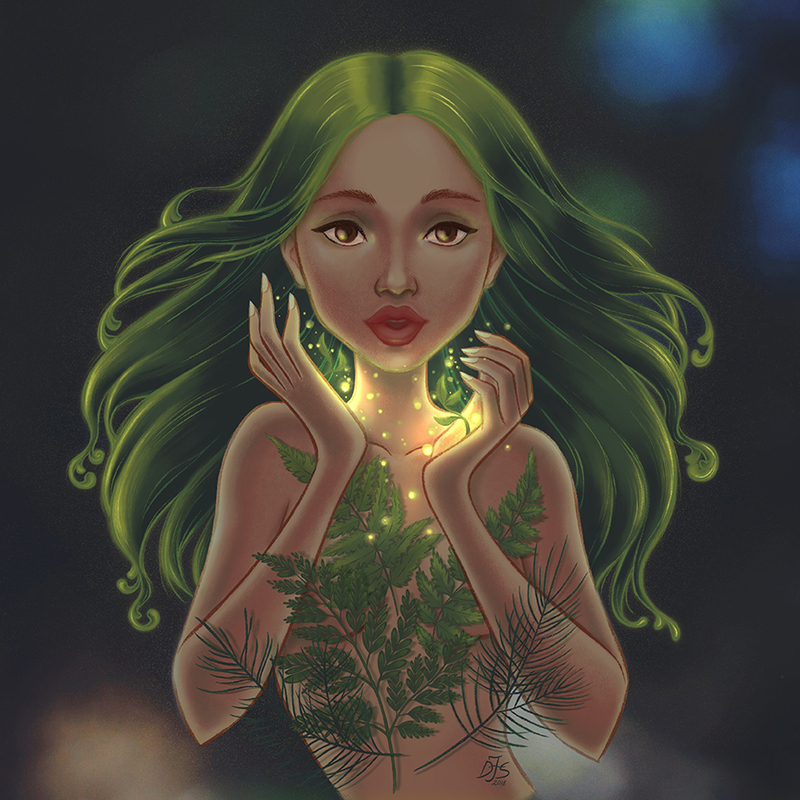 Dryad was done in Photoshop, with the first sketch done on paper, and subsequent changes all done digitally. So, this illustration had been in the making for a long time, but I had many changes of heart regarding her design, and it ended up taking me way longer than I expected to finish it. 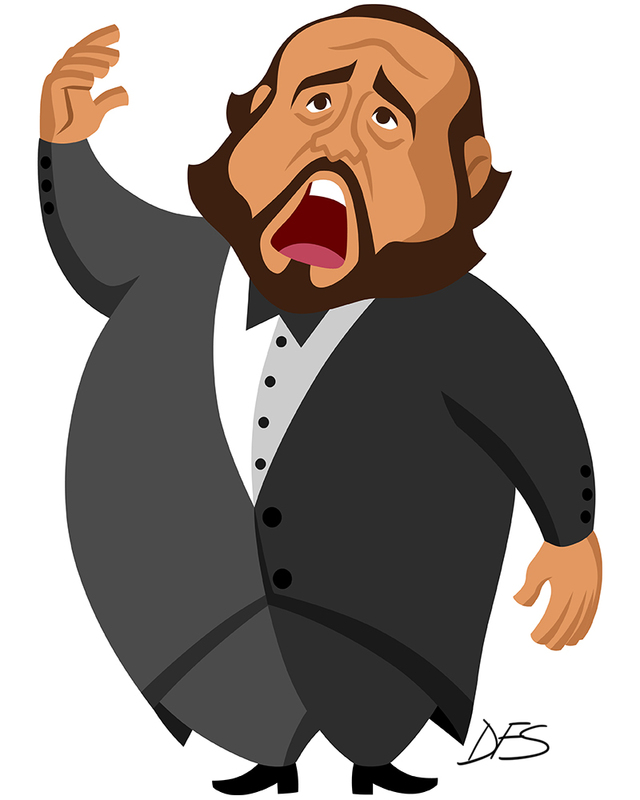 For the sake of comparison, scroll down to see the old version of it, which I wasn’t really happy about. 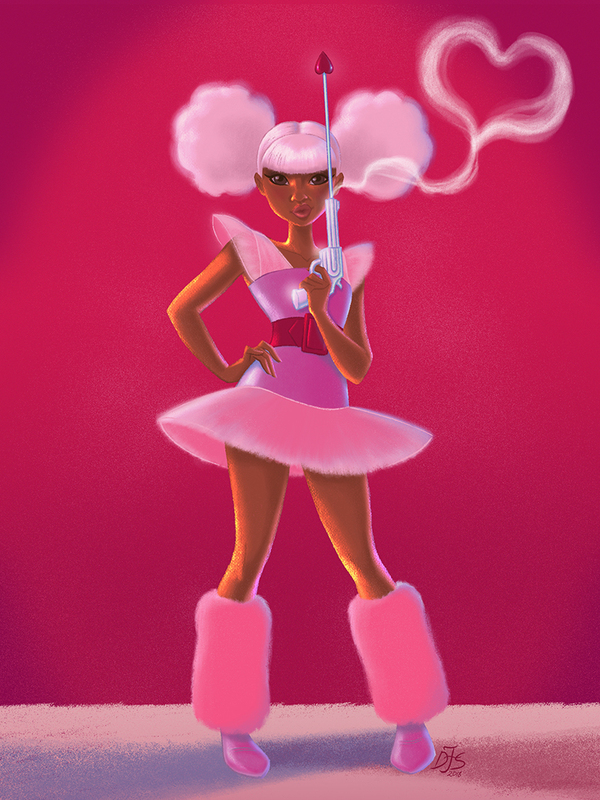 Cupid was done in Photoshop CC 2017, and the first rough was done on paper, but subsequent changes were all done digitally. 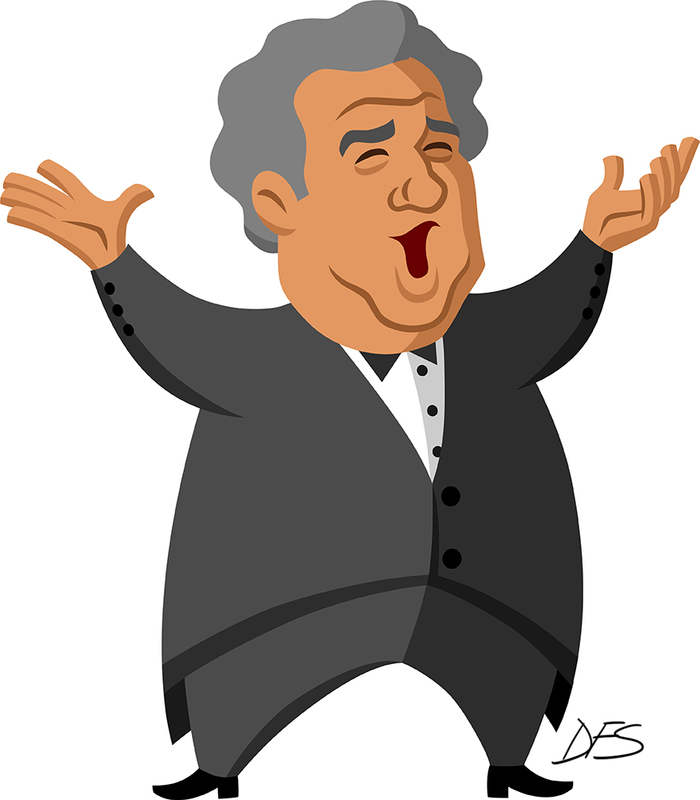 I haven’t done many caricatures in my career, but these were some that I really enjoyed doing, since I’m a great admirer of the Three Tenors, and I really like vector illustration. 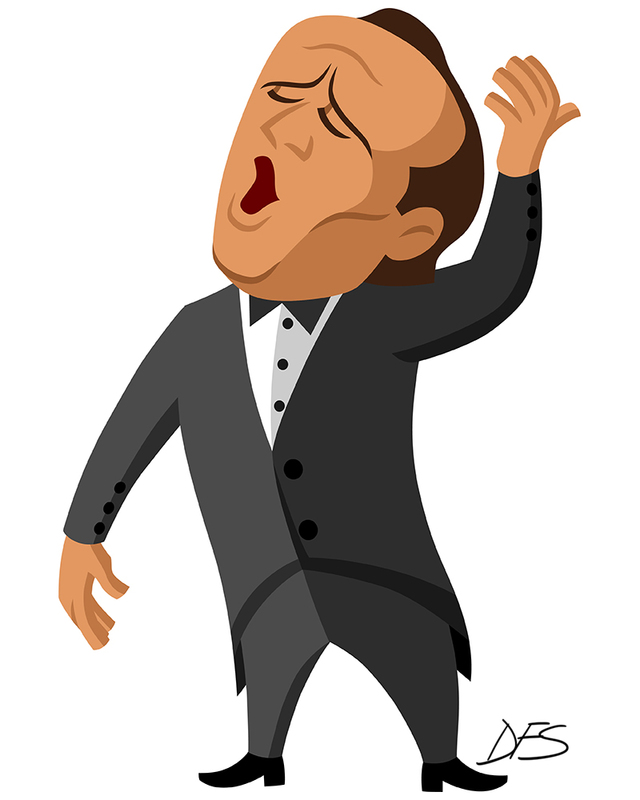 Eu não fiz muitas caricaturas ao longo da minha carreira, mas eu adorei ter feito estas, já que eu sou fã dos Três Tenores e gosto muito de ilustração vetorial. 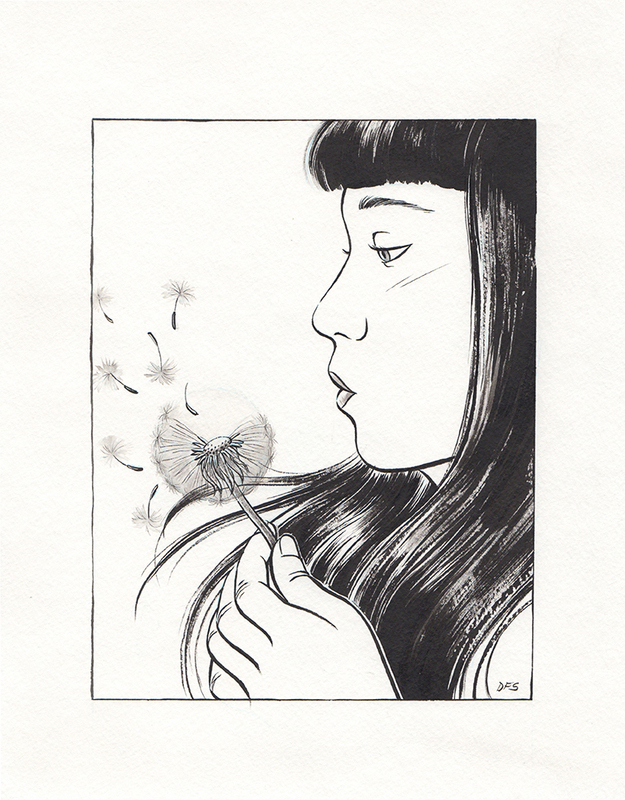 Illustration in ink (at first intended to be published during #inktober, oh well!) of a native Brazilian girl holding a dandelion. I need to do more inking, it’s actually quite fun! Done with a Kuretake calligraphy brush (I highly recommend it, once you get the hang of it, you can get amazing line variation with it!) and Dr. Ph. 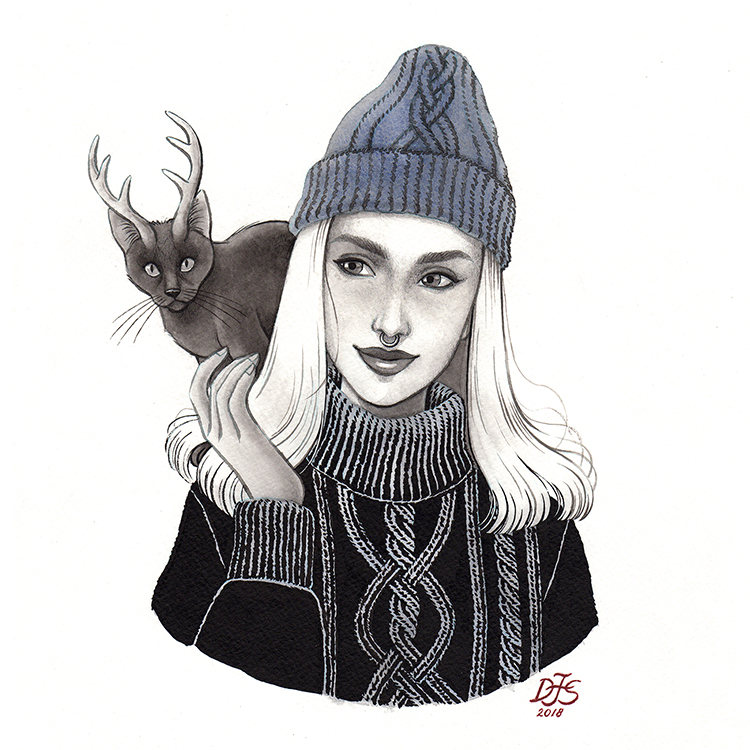 Martin’s Black Star India Ink, on Arches Watercolor cold press paper. Ilustração em nanquim (a princípio a intenção era publicá-la durante o #inktober, fazer o quê!) de uma garota indígena brasileira segurando um dente-de-leão. Eu tenho que fazer mais desenhos em nanquim, o processo é muito interessante! Feita com pincel de caligrafia Kuretake (recomendo muito; uma vez que você pega prática com ele, dá pra conseguir uma variação de traço incrível!) e nanquim Dr. Ph. Martin’s Black Star, sobre papel Arches Watercolor cold press. 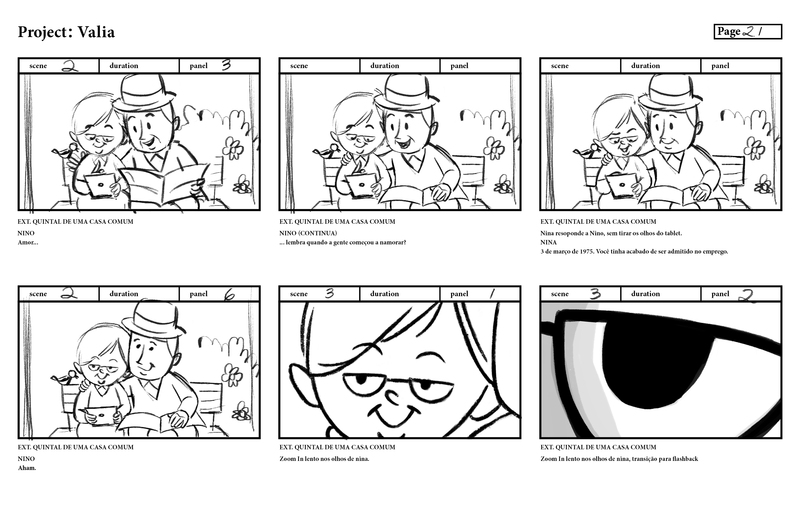 And here’s the animation for the storyboard from my last post. 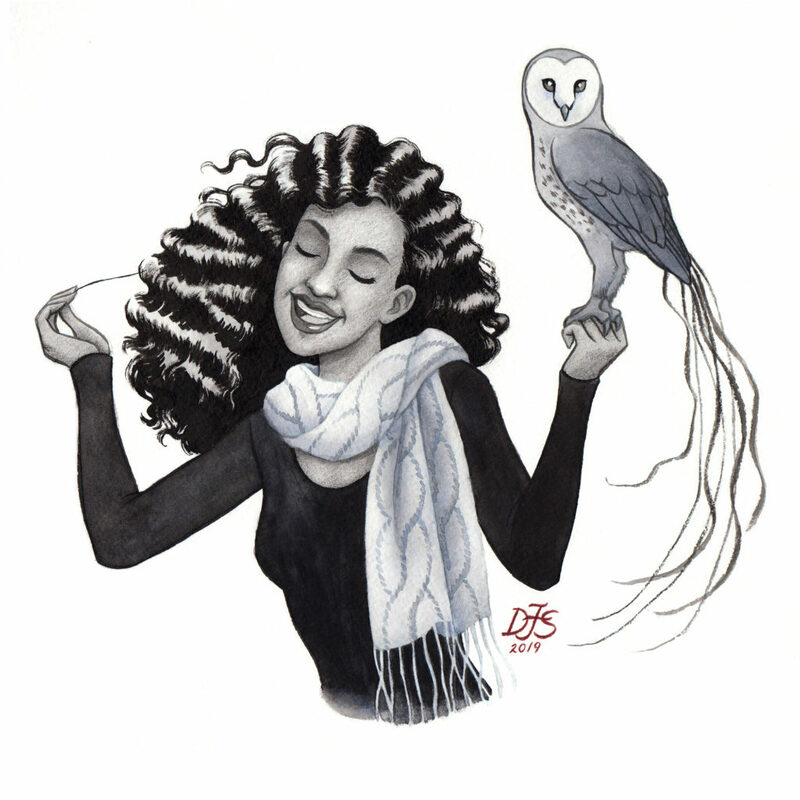 Animation by David Hoffman and Illustrations by Camila Fernandes. Animation done in After Effects, and Illustrations in Illustrator. 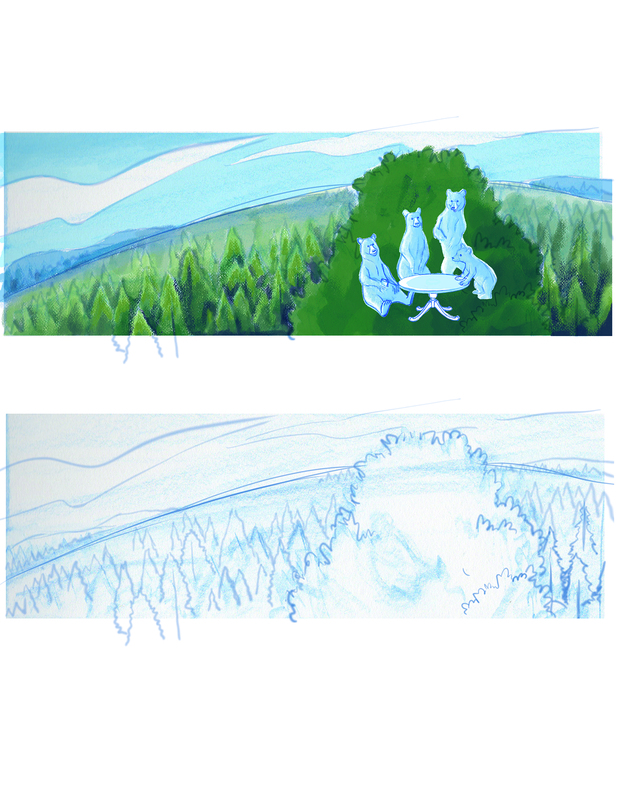 The storyboard was done in Photoshop. E aqui vai a animação feita a partir do storyboard que eu publiquei no meu último post. Animação feita por David Hoffman e ilustrações feitas por Camila Fernandes. Animação feita com After Effects e ilustrações com Illustrator. 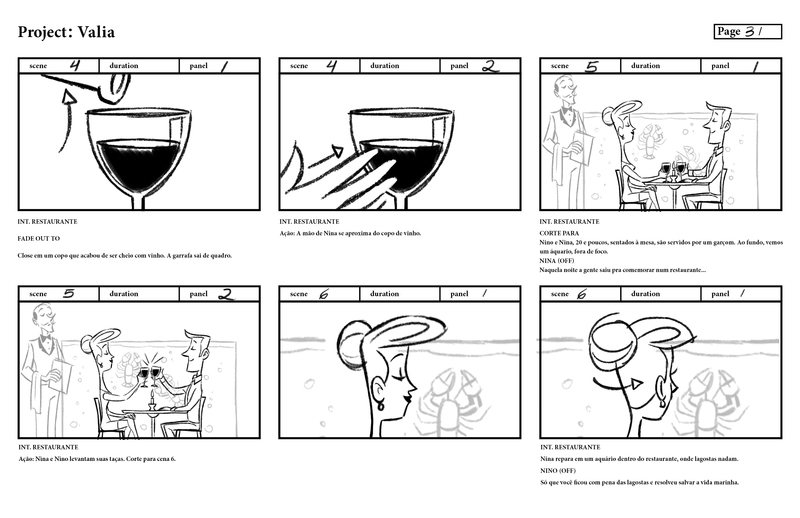 O storyboard foi feito no Photoshop. 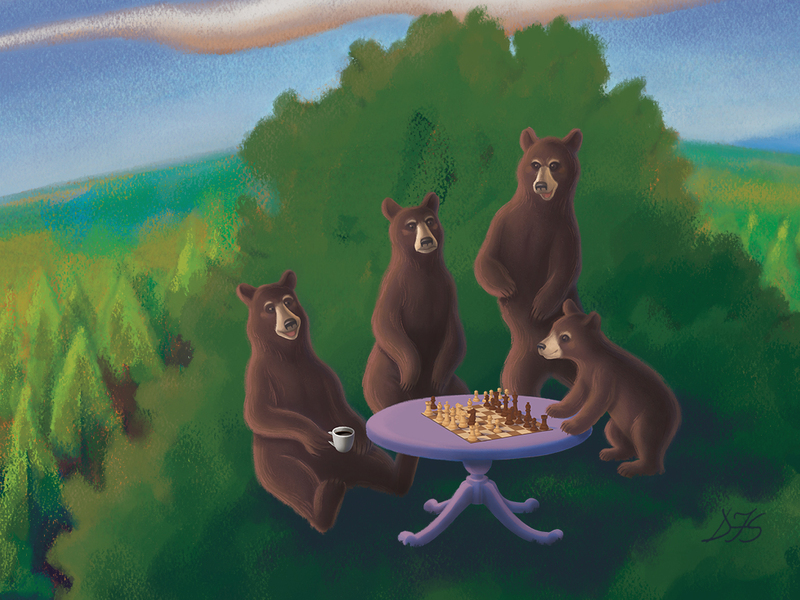 Digital painting of some bears chilling on a tree, drinking coffee and playing chess. I’m trying some new approaches, like using saturated colors and brushes that reproduce traditional media. Pintura digital de uns ursos relaxando em cima de uma árvore, tomando café e jogando xadrez. Estou testando abordagens novas, como usar cores saturadas e pincéis que reproduzem o efeito de mídias tradicionais. I really like seeing the creative process when I see a finalized painting, so, I’m going to share some of mine. 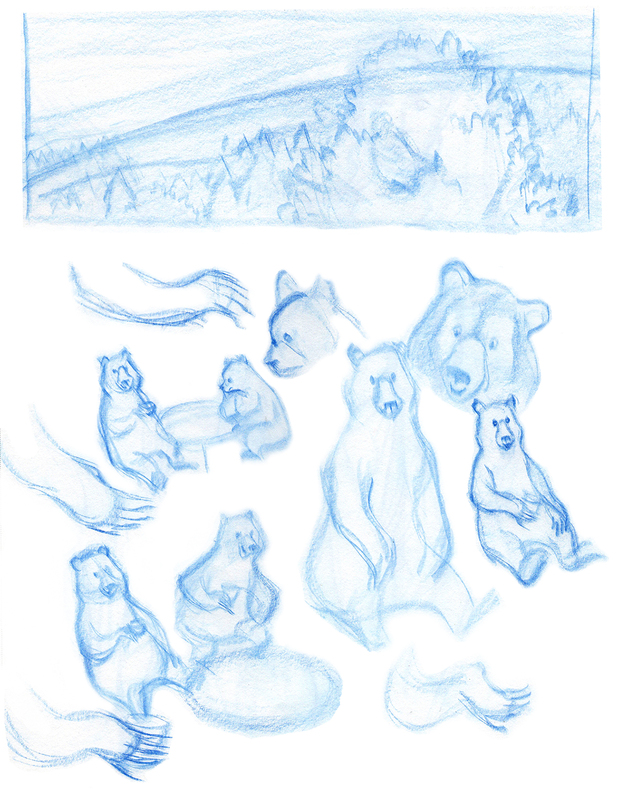 Here are the sketches I did for it, while I was still exploring ideas. At first, I was going for a more subtle approach, with the colors, but I wasn’t really happy with it, it didn’t match the playfulness I wanted to depict on this scene. Eu gosto muito de ver o processo criativo por trás de imagens finalizadas, então, vou compartilhar um pouco do meu. Aqui estão os rascunhos que eu fiz pra esta ilustração, enquanto eu estava explorando ideias diferentes. No início, eu tinha escolhido uma abordagem mais neutra, em relação às cores, mas eu não estava contente com isso, não combinava com a atmosfera divertida que eu queria mostrar nesta cena. 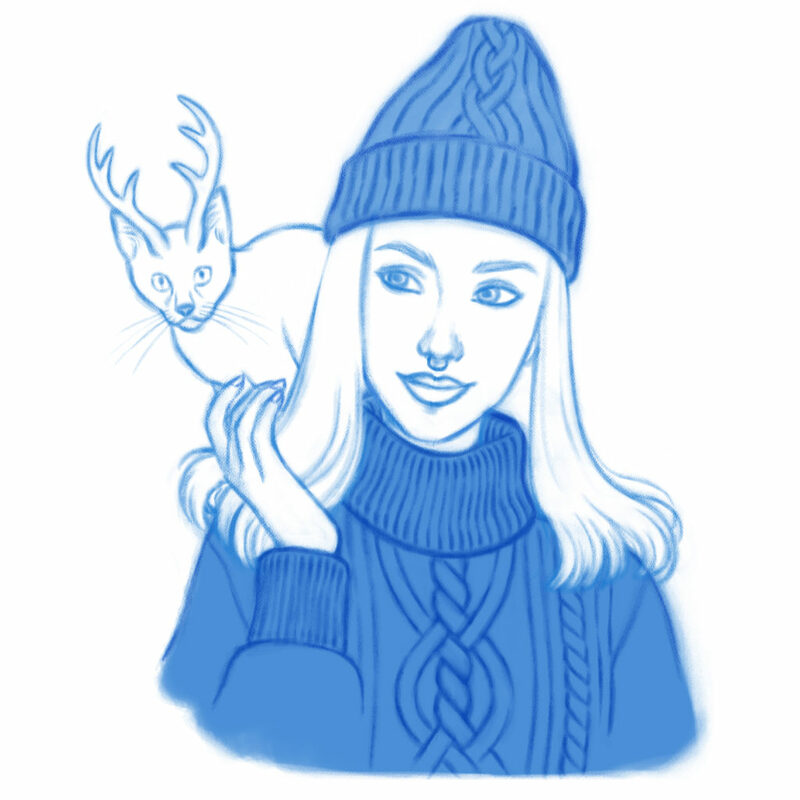 I decided to start a new “collection” of small illustrations (“almost” icons) of the National Parks in America. 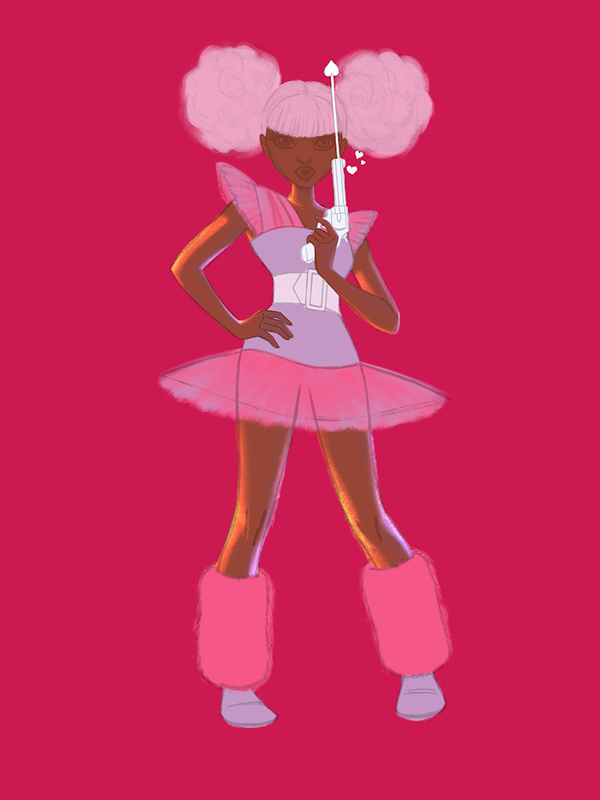 They’re vector drawings, so, they’re very stylized. 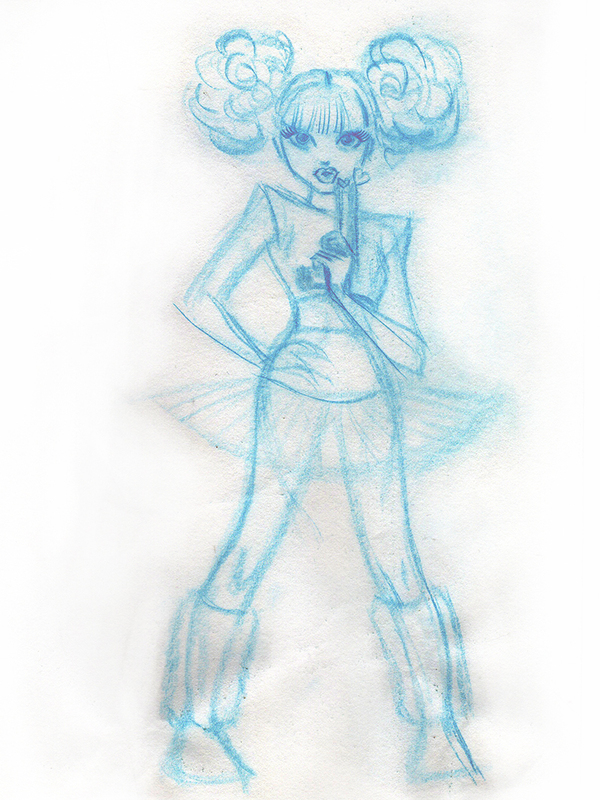 My intention isn’t to do something realistic, but I don’t want to make something completely “graphic”, either. So, I’m working to find a happy medium. These are the first two I’ve made, of the Arches and Badlands Natural Parks. Eu resolvi começar uma nova “coleção” de ilustrações em tamanho pequeno (ícones, talvez?) dos Parques Naturais aqui dos Estados Unidos. 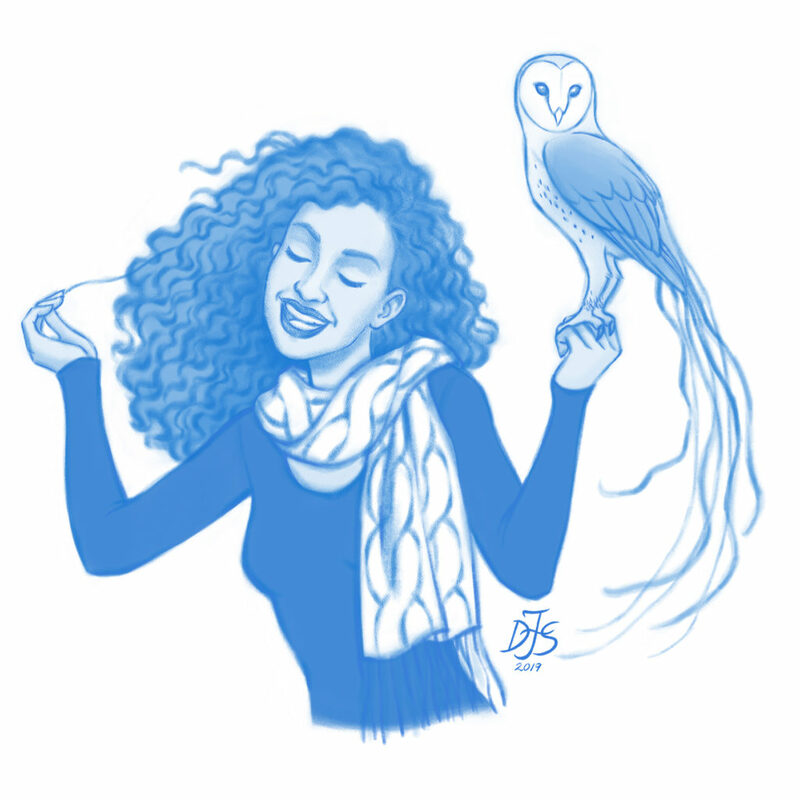 São ilustrações vetoriais, então, elas são bem estilizadas. Minha intenção não é fazer algo realista, mas ao mesmo tempo, eu não quero fazer algo totalmente “gráfico”. Então, estou trabalhando pra chegar a um meio termo interessante. Estas são as duas primeiras que eu fiz, do Arches e do Badlands Natural Parks.